The then Ministry of Urban Development, Government of India set up in July 1990 the Building Materials and Technology Promotion Council (BMTPC) as an apex body to provide inter- disciplinary platform to various agencies under the Central and state Governments and the private sector to promote development and use of innovative building materials and technologies. During its decade of service BMTPC has promoted development, manufacture and use of such materials and technologies. Emphasis was laid on environmental protection through use of wastes, energy conservation, development of substitute materials for scarce materials like wood etc, disaster resistant construction technologies, and consequent social advantages of cost reduction, energy conservation and sustainable development strategies. 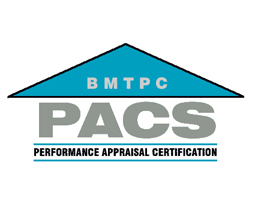 In order to give greater impetus to the actual use of such materials and technologies to derive the envisaged social benefits a scheme called Performance Appraisal Certification Scheme (PACS) has been instituted by Ministry of Urban Development and Poverty Alleviation, Government of India.